King Solomon’s proverbs stress again and again the valor of houses – and their connection to wisdom. But today, economic conditions and an iffy employment picture are convincing some homeowners that the wisest option is to rent out their properties. 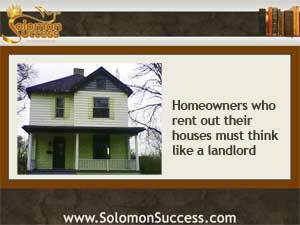 And while becoming a reluctant landlord may be a prudent move that can open the door to new opportunities in income property investing, these homeowners turned rental property owners can face problems both big and small if they skip a few key steps. If you decide to rent out a home that once was your primary residence, an important first step is to switch from a standard homeowner’s policy to rental home insurance. This covers the property itself and provides liability protection, but it doesn’t cover possessions, furnishings and the like. That becomes the responsibility of tenants, who can get renter’s insurance to protect any possessions they bring onto the property. Although some landlords choose to cover certain utilities, that usually happens with a multi-unit property. Before renting out a house, though, it’s important to ensure that you’ve closed out any utility accounts held in your name. Tenants will need to start their own utility services so that the new landlord isn’t held responsible for missed bills. One of the most daunting tasks facing new landlords is actually renting out the property. It may be simple to advertise the house for rent, but then come steps like screening tenants and finalizing the lease agreement. Inexperienced landlords may fail to screen tenants carefully, or leave important clauses out of the lease or rental agreement. Getting the help of a real estate professional or even a lawyer to create a good rental agreement can help forestall issues down the line. If you’ve made the shift from homeowner to landlord, you now have a business, so it’s important to see your income property in that light. Even if you choose to outsource aspects of managing the property to a management company, you’re still the one in charge. Maintaining a home office, keeping goof records and establishing a businesslike relationship with tenants builds credibility and establishes authority.